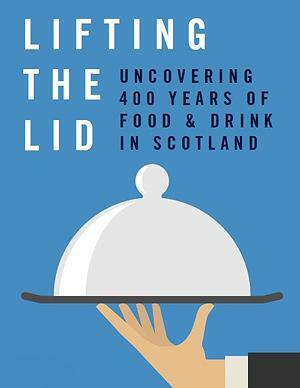 You are invited to attend an exclusive Curator led tour for ELISA members of the current NLS exhibition Lifting the Lid: four hundred years of food and drink in Scotland. This is an opportunity to hear from the curator of the NLS’s summer exhibition. If you don’t know a peck from a mutchkin or you fancy serving mock turtle soup for your next dinner party come along on the 16th Sept and see how the diet of our ancestors has influenced what we eat today. Please reserve your place via Eventbrite if you would like to take up this offer. PLEASE also advise Fiona – f.laing@nls.uk – if you need to cancel after booking so that someone else can take your place. I had a thoroughly enjoyable tour yesterday of the National Library of Scotland’s summer exhibition Lifting the Lid by Olive Geddes, the curator responsible for the exhibition. Trying to cover 400 years of food and drink in Scotland is quite a challenge. The exhibition has been split into themes rather than being chronological. These include soup, bread, fish and meat, vegetable, desserts and baking, jams and preserves.The exhibition shows recipe books from the 1600s right up to the modern day, household accounts, menu cards and tradesmen’s bills. You are able to see how the Scots had a fairly healthy diet many centuries ago and the changes that the importing of foodstuffs such as sugar has impacted on our diet. The exhibition is set to coincide with Scotland’s Year of Food and Drink. The exhibition is free and runs until the 8th November. 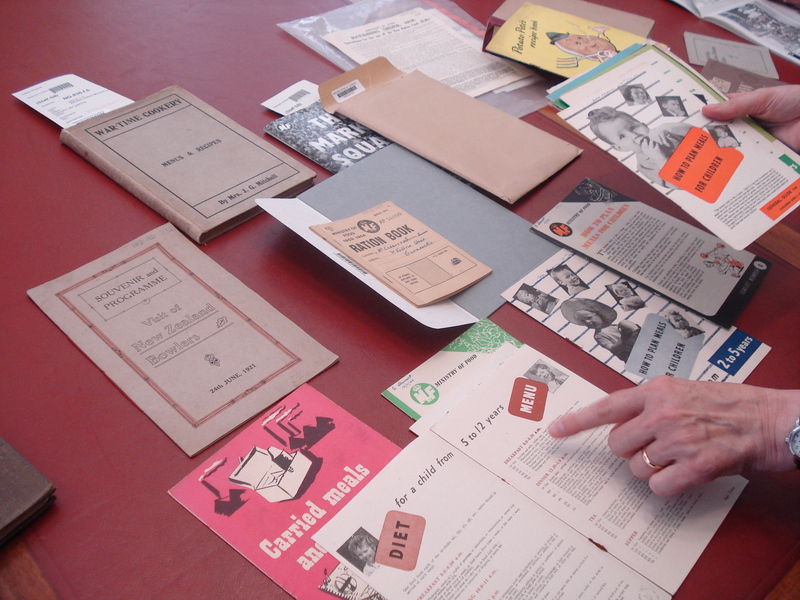 More information can be found on the National Library of Scotland website. Whilst I was preparing for a future event in the Library to tie in with this exhibition I was looking at a book in our collection published in 1917 called War-Time Cookery: menus and recipes by Mrs J. G. Mitchell. As well as enjoying the many interesting adverts in the book I found recipes for Brown Soup (basically using the carcase and trimmings of a duck along with the giblets) kidneys on toast and Mrs M’Nab’s scones. 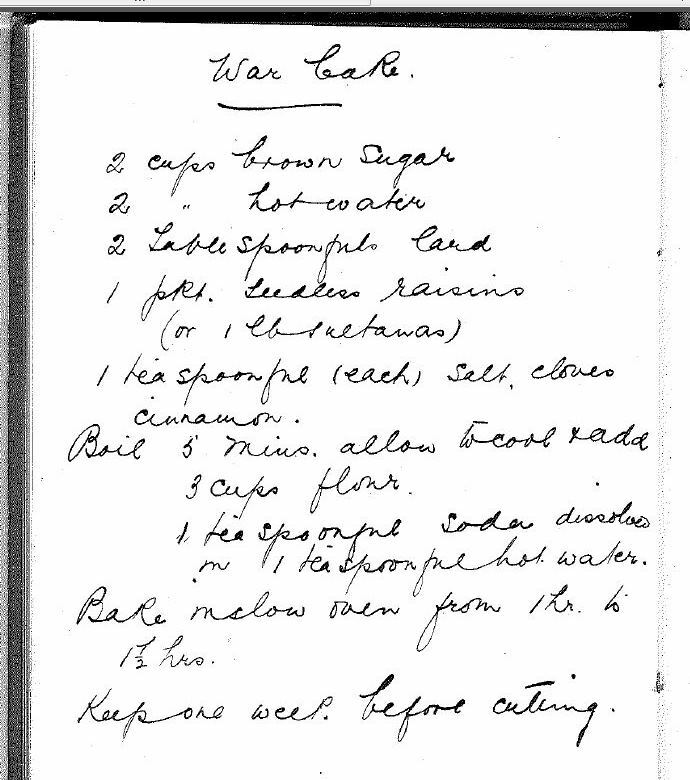 Hand written into the book was a recipe for a war bake which I thought I would share with you. If you would like to find out more about these recipes and consult the book it is available for consultation in our reading room in George IV Bridge. Shelfmark NG.838.f.6 Alternatively you could come along to our Hidden Library event on the 12th Sept 2.-4.30pm where you learn about the Library’s connection with Sir Alexander Grant and his digestive biscuits, and find out more about rationing and what people cooked during the world wars. Younger visitors can bring their teddy bears along for an afternoon of story-telling and drawing activities.